New software will demand new chip designs, and big chances for the industry to innovate. The migration from human-driven to self-driven vehicles in the next few years will provide the semiconductor industry with new opportunities. Vehicles on the road today have so far featured only a few digital enhancements and even less automation. Indeed, the most noticeable enhancements have been made in the advancement of the infotainment console within the dashboard – the ability to stream music coupled with the ability to find gas stations, restaurants or even the ability to book a hotel room while on the road. These enhancements, however, are relatively cosmetic as they do not affect how the vehicle performs on the open road. All complement the driver experience (and safety). They do not fully automate the act of driving or replace the driver. For the truly autonomous vehicle, a lot more innovation must be done. To understand the challenges ahead, research teams have been attempting to automate driving. 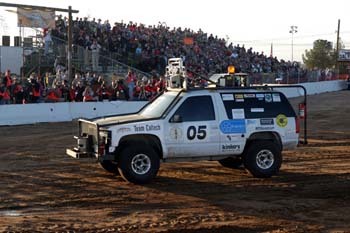 In 2004, research teams competed in the DARPA Grand Challenge in the desert; autonomous vehicles had to drive 17 miles. Most didn’t make it. The winner, from Stanford, did, but the vehicle was unwieldy and impractical for consumer use because it kludged together existing technology and forced it to behave differently from how it was originally intended. Enabling truly autonomous vehicles in the near future will require all-new chips and subsystems that are designed specifically for this purpose. Beyond becoming a mere data center on wheels, autonomous vehicles will also need artificial intelligence with machine learning to think on the fly and to navigate unknown obstacles found in the real world. For example, how will an autonomous vehicle know to drive differently on an icy road as opposed to a normal, dry road? So how will the semiconductor industry enable the automotive industry to produce these autonomous vehicles? 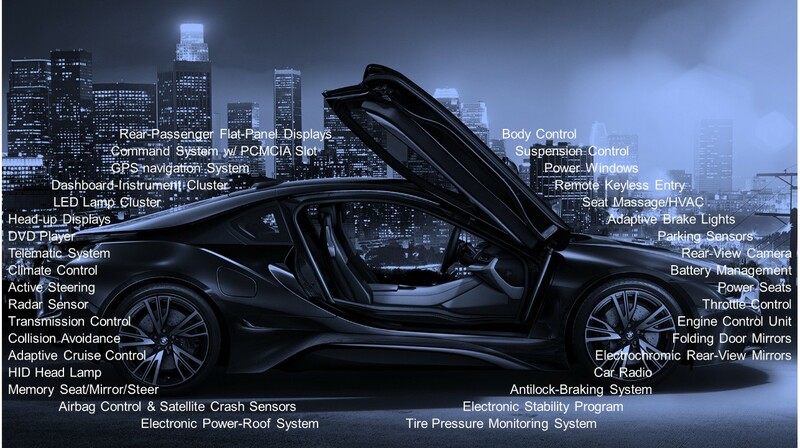 Fundamental to the automotive industry are vehicle security, functional safety, reliability, and compliance. Meeting these requirements is even more of a challenge with autonomous vehicles. The current standards and regulations create the need for new chip designs. For example, the underlying integrity of the circuitry in a chip must be stable and predictable in a wide range of conditions, and some redundancy must be built in to ensure safe operation while the vehicle is driving seventy miles an hour on the open road. Vehicle to everything (V2X) connectivity will also add a new level of chip complexity. As early as 2010, there was already an example of vehicle chips, processors and software being affected by stray cosmic rays. In the early years of the millennium, Toyota drivers reported unintended and unexplained acceleration in their vehicles. By 2009, the company had to recall 7.7 million vehicles. It was digital forensics that later found it was possible for a ray from outer space to change a 1 to a 0, and in some cases trigger the acceleration. Given such fragility with circuitry, what must be done to reliably depend on electronics as we’re barreling down a freeway at 70 mph? One of the ways to improve safety and reliability in processors is a dual-core lock-step solution. Here you have two processors performing the same calculations and constantly checking to see whether the other gets the same answer to the calculation. And if not, the system must perform specific actions, such as turning on a warning light or maybe even gradually moving the vehicle to the side of the road at a reduced speed, avoiding other cars and obstacles while shutting down. There has not been much need for this redundancy and crisis management in automotive chip design before now. If you look at the automotive space, there is a massive intersection for hardware and software that will change and re-invigorate the semiconductor industry. The advanced software necessary for autonomous vehicles will demand dedicated advanced hardware. In turn, advanced hardware will demand unbelievable new software. Vehicles currently on the road have complex LIDAR (Light Detection and Ranging) systems to sense obstacles such as pedestrians or other vehicles nearby. Vehicles coming on the market later in the year will have many more sensors combined with advanced connectivity using 802.11p protocols (also known as WAVE) that not only help the vehicle sense, but communicate with other connected nearby vehicles in real time, and even vehicles up ahead and around the corner. 802.11p uses Direct Short Range Communication (DSRC), which is faster than cellular-based 5G. Implementing 802.11p for vehicle to infrastructure (V2I), which can switch traffic lights and inform vehicles of accidents or road closures, will of course require parallel roadway enhancements – which is another topic for discussion. Suffice it to say, autonomous vehicles will have an enormous number of sensors producing an immense amount of raw data. This will create data streams that are larger than any other computational system we’ve seen before. Already, navigation systems upload everything from address requests to actual drive times. And this data evolves through continued, active use. A tangible result of this activity are the alternative routes presented to drivers today. A human driver can consider each and act when appropriate. For autonomous vehicles, these alternatives must be considered and accepted or rejected quickly and without human interaction. Here, data analysis with life or death consequences will need to be performed cautiously. This will require new software to analyze constantly updated and changing data to make those on-the-fly almost-human like decisions. This will require more advanced software such as vision-based, enhanced processors. Today, a modern vehicle contains over a million lines of software code. By comparison, a common field mouse has about 200 million lines of code in its DNA. Logically, an autonomous vehicle in the future will have as much if not more lines of code than a common mouse. As stated before, new software will demand new chip designs and new chip designs will allow for more advanced software, paving the way for artificial intelligence and machine learning. Autonomous vehicles will be the focal point for a massive amount of data requiring faster, better communications and more efficient storage. And, they will drive opportunities for the semiconductor industry.